Region 4 local league coordinators showed appreciation to captains by hosting a party Dec. 13 at the Florida Tennis Center Daytona Beach. Captains were recognized, awards were presented, dinner was served and plenty of tennis action took place on the courts. Captains and their guests had the option to play recreational tennis matches, high energy Cardio-Tennis or to hit with Boomer, the tennis robot. This was the very first captains’ appreciation party for Region 4, and there was a great turnout with more than 30 league players. 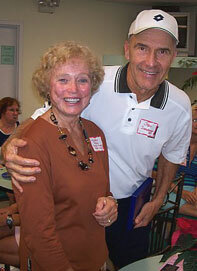 Gail Neufeld captained a region 4 Senior Mixed 8.0 league team and an Adult Ladies 4.0 team this year. She has captained teams in the area for more than six years and loves to volunteer as a captain. Many captains like Neufeld enjoy volunteering and find it rewarding to captain a team. Captains help introduce new people in the area to team members and get players involved in practices. 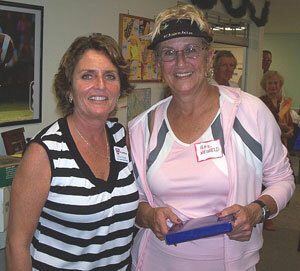 Sandy Marshall, USTA Florida league coordinator, was encouraged by the large turnout of enthusiastic league players and their guests. "It was a huge success and a big step forward for the local league," Marshall said. "We are very excited. 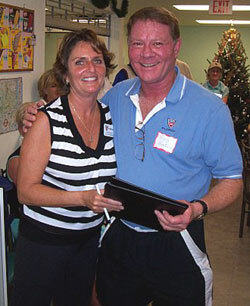 In 2007, region 4 anticipates the largest number of league captains the area has ever had!" Every captain received an award for his/her hard work and dedication throughout the year. A raffle also took place and gifts were donated by local pros and USTA Florida.